How receptions of sensory inputs information turn into perceptions in our brain? To address these questions, we proposed method reconstructs the neuronal tracts by applying the shortest path graph algorithm between functional regions in the Drosophila brain. 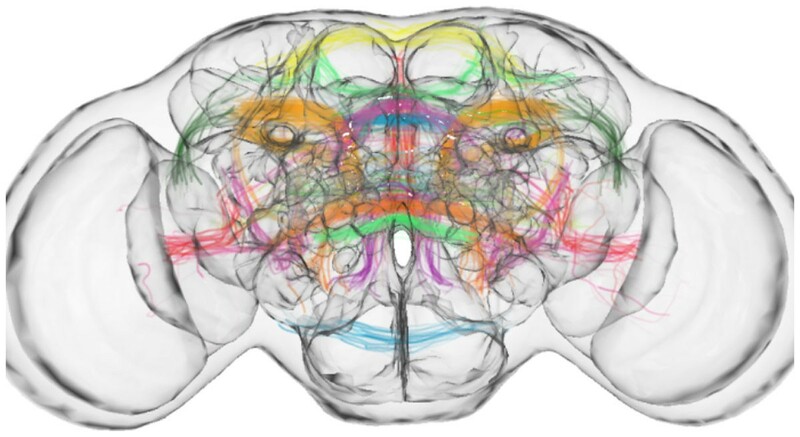 With these neuronal tracts, we analyze and draw a network diagram of projection neurons (PNs) relaying sensory input to higher brain centers in the Drosophila brain. Drosophila is a widely used genetic model system for understanding human biology [1, 2]. While distinctively different in gross anatomy, insect brains and mammalian brains are both made of neural circuits with a cohort of similar gene expression governing the basic demands of life. With this network diagram, numerous unexpected local networks and inter-regional pathways were found from our initial analysis of sensory systems including olfactory, gustatory, auditory, and vision circuits . Numerous PNs tracts relaying sensory inputs - including olfactory, visual, auditory, and gustatory - to higher brain centers were discovered. The network diagram shows hierarchical structure, small-world characteristics, and is composed of functional modules corresponding to the sensory modalities. This ultimate goal of such an atlas is to identify connectivity between neurons for understanding the function/circuit relationships.